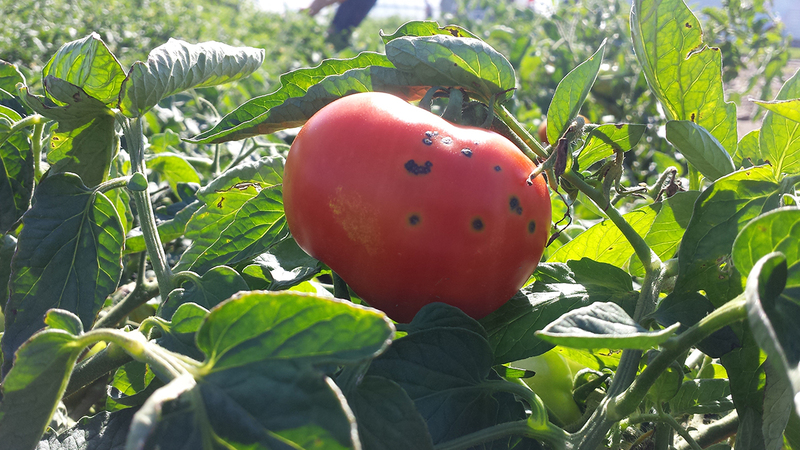 Bacterial speck disease creates unattractive black spots on a ripe tomato, making it unmarketable. Researchers at the Cornell-affiliated Boyce Thompson Institute (BTI) and Virginia Tech have discovered a new weapon in the arms race between plants and pathogenic bacteria, which tomatoes use to detect the microbe that causes bacterial speck disease. The team identified a new receptor in tomato plants, called FLAGELLIN-SENSING 3 (FLS3), which triggers defenses against a bacterial attack. FLS3 is present in a small number of plant species, including tomato, potato and pepper. The study appears in Nature Plants. FLS3 is the second flagellin sensor discovered in tomatoes. The first, called FLS2, is found in most land plants and detects invading bacteria through recognition of a separate region of flagellin. Several bacterial species have acquired mutations that change the shape of their flagellin so that FLS2 can no longer recognize it. The acquisition of the FLS3 receptor may, therefore, serve as a countermeasure on behalf of the tomato to detect bacteria with altered flagellin. Martin and his colleagues worked with postdoctoral researcher Christopher Clarke and professor Boris Vinatzer at Virginia Tech, who previously identified flgII-28 as a conserved segment of the flagellin protein that tomatoes can detect. Additionally, Martin and other colleagues had screened heirloom tomato varieties and found that some, including Yellow Pear, could not respond to flgII-28, suggesting that the tomato must be missing FLS3. “Discovering that some heirloom tomatoes, such as Yellow Pear, did not respond to flgII-28 was key to using a genetics approach to identify FLS3,” said senior author Martin, the Boyce Schulze Downey Professor at BTI and a Cornell professor in the School of Integrative Plant Science. In the current paper, Hind used Yellow Pear tomatoes together with a wild relative of tomato called Solanum pimpinellifolium to identify the FLS3 gene and show how it functions to reduce bacterial growth. But to confirm that FLS3 is the receptor for flgII-28, she needed to demonstrate the two molecules can physically interact. Researchers in the laboratories of Martin and Frank Schroeder, BTI associate professor, developed biochemistry techniques to identify a stable complex between FLS3 and flgII-28, thus validating FLS3 as the flgII-28 receptor. “Proving direct interactions of biomolecules has remained a huge challenge, and our work will help in developing better approaches for exploring receptor-ligand interactions,” said co-author Schroeder, who is also a Cornell professor in chemistry and chemical biology. Additional BTI researchers on the project include research associate Susan Strickler and graduate students Joshua Baccile and Jason Hoki. Former BTI researchers include postdoctoral scientists Patrick Boyle and Zhilong Bao, research assistant Diane Dunham, graduate student Inish O’Doherty, and undergraduate intern Elise Viox.